From the author of the #1 New York Times bestseller She Persisted comes a beautiful book about the animals who share our planet--and what we can do to help them survive. Did you know that blue whales are the largest animals in the world? Or that sea otters wash their paws after every meal? The world is filled with millions of animal species, and all of them are unique and special. Many are on the path to extinction. In this book, Chelsea Clinton introduces young readers to a selection of endangered animals, sharing what makes them special, and also what threatens them. 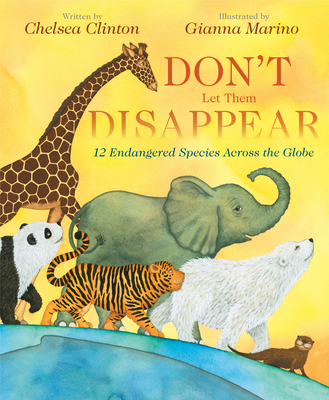 Taking readers through the course of a day, Don't Let Them Disappear talks about rhinos, tigers, whales, pandas and more, and provides helpful tips on what we all can do to help prevent these animals from disappearing from our world entirely. Gianna Marino (giannamarino.com) was born in San Francisco and spent her early years galloping horses through Golden Gate Park. She's made a living as an apprentice to a muralist, a jewelry designer, a product designer and a horse carriage driver. Addicted to foreign adventure, Gianna has traveled worldwide, including Europe, Asia, Australia and Central and South America. Between explorations, she lives and works in Northern California and still gallops on horses.